Now that I had spent some time gathering requirements for the redesign of www.steveweeksmusic.com, it was time for me to take inventory of the site. As I mentioned before, years of tacking on random things to my web pages had resulted in a site that was unmanageable for me and for visitors. There was just way too much, and 80% of it was rarely used if ever. Before I started thinking about the actual design of the various pages, I wanted to determine what should be on each page, how should items be prioritized, and just as importantly, what should be left out. This can be a dry part of the design process, one that I’m tempted to skip when working on my own sites, but it’s a really important one. The choices and organization of content can even drive and inform the design. The process was fairly simple. I sat in coffee shop with my little journal and wrote down the main pages that I thought my site should have. 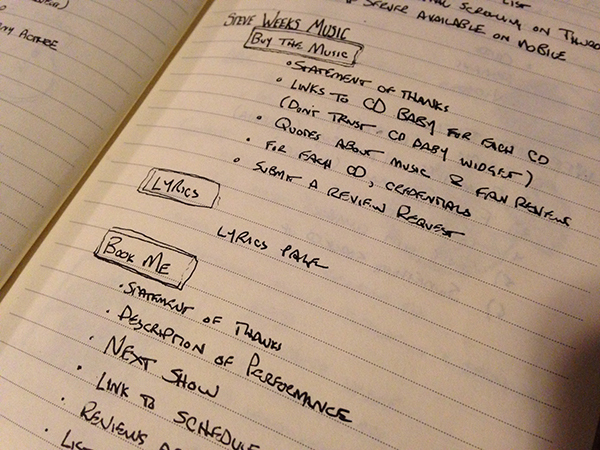 Then for each page, I listed and prioritized the information that I wanted to present. I tried really hard not to think about layout, colors, fonts and other design elements during this stage. Inventorying the site actually did spark some innovation though. It was at this point that I decided that each page should have a little personal thanks or call-to-action on it. I had already decided that I wanted to use the site to re-establish a connection to my fans that I felt had been lost a bit in this new world of digital streaming. I know a web page isn’t the most intimate communication, but still, I wanted to at least try and connect with the people who are browsing the site. Whether it accomplishes that remains to be seen. This is also a new world of 14 second web page visits. So, for example, on my performance page, instead of launching right into my credentials and pitch, I wanted to briefly thank all the folks who’ve attended my performance or supported me. People have said really nice things to me at concerts, bought my CDs, and even let me crash on their couch. I wanted to acknowledge that. The most cathartic part of making a site inventory was knowing how much unwanted stuff I was leaving out. It felt like Spring cleaning. I actually got to delete some database tables! In the end it was a fairly straight-forward list. I’ll provide an excerpt of the list below for those following along just so you get the idea Nothing too shocking. I do highly recommend this step if you’re designing a web site though. It’s your one moment to really start off organized and light-weight.